Some babies are incredibly noisy sleepers (which can be reassuring) but others sleep very soundly, to the point where they barely move an eyelash. I’m quite sure that every new parent, particularly those of the barely-move-an-eyelash-variety, have at some stage looked at their sleeping baby and thought “Are they okay? !” Well now there’s (almost) a monitor to answer that very question. Sproutling, a start-up company assisted by Lemnos Labs, is on the verge of launching a baby monitor that is quite different from anything else that is currently available. 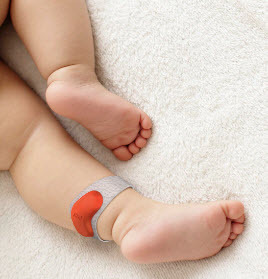 The Sproutling monitor is a small wearable device that is Bluetooth-enabled and fits onto a baby’s ankle. In conjunction with a base station, a small camera and an app for your mobile phone, the Sproutling system delivers all sorts of information on your baby’s wellbeing, from heart rate, temperature and more. The aim is that parents can use the data to determine optimal sleep conditions for their child. Most significantly, the device alerts you if your child stops breathing. The release of the Sproutling device is reportedly more than six months away, although we do know that the device was designed by the same team responsible for the Bugaboo, so you can be sure that it will look fabulous. Is a wearable device such as the Sproutling something you would consider using?